When it comes to tooth replacement options, dental implants are the gold standard. Beckham Dental in Cave Creek, AZ has made a huge investment to offer you the most effective dental implant options available. Our dentists, Dr. Beckham and Dr. Ellsworth, have completed hundreds of hours of continuing education courses to make sure your treatment is as effective as possible. They are titanium fixtures greater than 3mm in diameter that are placed in the jaw (bone) to replace single or multiple missing teeth. 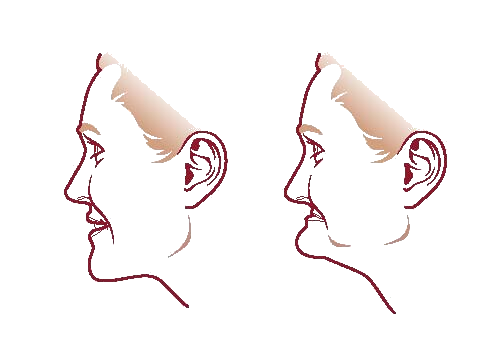 They can be placed in areas of the jaw where no teeth are present, or can be immediately placed into a tooth socket after the tooth has been removed. We term this procedure immediate implant placement. The bone is allowed to heal around the implant. In three to six months the bone has actually fused (integrated) to the implant. 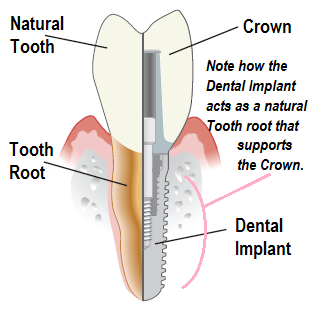 The implant can then be used to replace a missing tooth or teeth, or to anchor another form of dental prosthesis. When are Traditional Implants used instead of Mini Dental Implants (MDI's)? 1. When the bone height available is very short. 2. When there is a large amount of bone width available. 3. When immediate implant placement is desired after a tooth extraction. 4. When the quality of bone remaining is poor requiring a two stage procedure. 5. When the sinus or vital structures are in close proximity. * Keep in mind, dental implants rank among the most highly successful dental procedures performed. Why are dental implants frequently the best treatment option? When natural teeth are removed, the bone in the mouth is no longer stimulated and begins to resorb or degenerate. Implants provide the necessary stimulation to the bone to keep the jaw bones strong and healthy. People with missing teeth have trouble eating certain fruits, vegetables, and meats. Eliminating these items from your diet can lead to poor nutrition, and failure to chew these items properly can lead to digestive problems. It has been clinically shown that people with poor chewing function are on significantly more (17%) medications for gastrointestinal disorders than those with good chewing function. Implants stabilize your prosthesis to enable good chewing function, allow you to eat a balanced diet, and minimize digestive problems. Best dentist and staff anywhere! 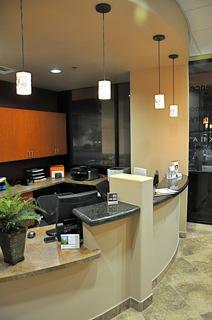 Terrific professional atmosphere with a great warmth for the patient from the entire staff. Will highly recommend Beckham Dentistry to all friends and family.